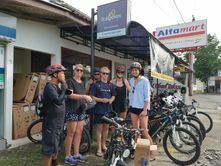 Bali eBikes is the most convenient Bikes Tours & Rentals in Ubud and Bali. The proof? This is what they say about Bali eBikes service.
" 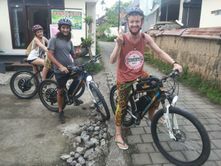 Yesterday we explored Ubud by e-bike, the most fabolous, freeing method of Eco-friendly transport around!! These babies run on re-chargeable battery packs that operate the back wheel and last for six hours. @baliebikes are super helpful and will replace battery packs as soon as they get low on energy. If you're looking to explore the farthest reaches of Ubud I'd consider these over a scooter any day. They're TONNES greener, smoother and more compact so when you're making your way up to the rice paddies along those crowded roads you can weave in and out of scooters, over taking them as they look on like wtf?!!! These things still aren't a major way to travel so we found it fun to zoom uphill cycling the pedals backwards to trick people. Hohoho. Pranks. Rent them via these guys!! @baliebikes. " " Very Punctual - Great happy team with loads of knowledge. Was prepared to get a speeding ticket when Nicole had to "pee!". Thanks guys. We loved this experience and lunch provided with bonus swim after hot ride was brilliant. We don't see any flaws. Thank you "
Copyright © 2017 Bali eBikes. All rights reserved.